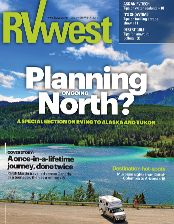 We are now offering a complimentary subscription to RVwest magazine. Simply fill out the information below and we will mail you a copy absolutely free. RVwest is published every two months and features attractions and activities for RVing in destinations throughout Canada, USA and Mexico. Our RVwest Online Magazine is an exact copy of the print version of RVwest — which is published every two months — giving you the same great articles in an easy-to-read digital format. In addition, it provides direct links to any online resources you come across in the magazine. If you are updating your address, enter your new information. RVwest is only available to residents of Canada and the United States.